One of the most important visual statements for any home are its garage doors. Modern homes have attached garages with many facing the street. This look reflects the importance our cars have to our lives today as garages are rarely separate nor are they tucked away behind the home. If you are looking for a new look to your home, consider changing the current garage door design. While your neighbors may be looking at brick, vinyl siding and rock face to transform their homes, you can begin with your garage doors to achieve a new and refreshing look that will wow your neighbors and yourself. Larger homes can gain an even more formal and stately look by opting for distinctive carriage house designs that add elegance and charm to the home. Such doors are usually constructed of embossed wood for a textured look. 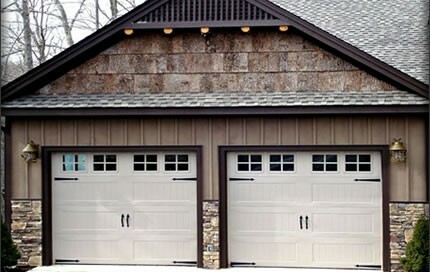 Carriage house garage doors are as tall as seven to eight feet and may have as three or four panels. Each door is topped by windows to allow in natural light, but are placed just above the line of sight to keep peering eyes from looking inside. Homes that are very modern need garage doors that complement the way that they look. No dark brown wooden doors for these homes. Instead, aluminum doors with heavy duty frames and employing commercial-grade aluminum are the way to go. The advantage of choosing aluminum include choosing a contemporary look that can also be painted to match the home’s exterior. Galvanized hinges and fixtures enhance the newfangled design; the light filtered glass offers a design statement too. Using real wood means doing real work to maintain the home. Siding is now vinyl, windows are also clad in vinyl and garage doors can become maintenance free if you choose fiberglass. Because fiberglass is so durable and does not require maintenance beyond the occasional power wash, manufacturers have developed doors that are still attractive. You can choose a fiberglass interior that advances the beauty of wood without the maintenance. Moreover, you can also choose a design that incorporates different colors as well as glass. Choose from horizontal raised, horizontal v-groove, vertical slat and vertical raised designs. Perhaps your home needs a stately look, but without the bother and expense of carriage house doors. A courtyard design can give you the appearance that you want, by employing steel with a wood look. Such doors are fashioned to create a timeless and elegant look, with classic designs in abundance. Steel doors are typically very insulated and are specially sealed to protect your garage from the elements. Avoid the draftiness that lessor doors can cause when a bitter north wind blows in. These doors are protected by two coasts of polyester paint, baked on to resist fungal decay, insects and changing weather conditions. 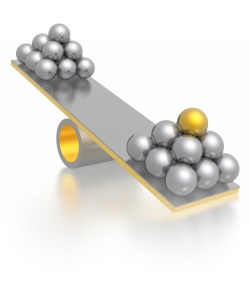 When shopping for garage doors you need to keep several things in mind. We already touched on style, insulation and upkeep, but there are other matters to consider. Your budget will, of course, have a large impact on what you can afford. Quite easily, the more elaborate and fetching doors will cost well north of $10,000 to buy and install, with removal costs of the old door included. Consider a heavier duty door if you have young children, one that one easily be scratched or dented if hit by a ball or run into by a bicycle. Lastly, choose a door that will stand the test of time: unlike the rest of your home, garage doors can look terrible after five years and need replacing. It would be better to invest in a door with a 15- to 20-year lifespan, one that will endure without much maintenance too. Tommy Mello owns A1 Garage Door Service in Phoenix, Arizona. He enjoys sharing garage improvement ideas and maintenance tips.